Sheetal Kolwalkar, Kaveri Agashe and Ketaki Phadke-Shah perform at the Jawaharlal Nehru Memorial Hall on 28th September, 2007. Raincloud is a freelancer, writing for The Times Of India, Pune supplements. These are four page supplements that are published three times a week. A bunch of freelancers have been assigned to make up for the content and photographs. Raincloud is one of them. So we happened to be at this event, I accompanied Raincloud out of sheer curiosity. A half-day arrangement for a month had been agreed upon at my workplace, in the process of shifting to another job. 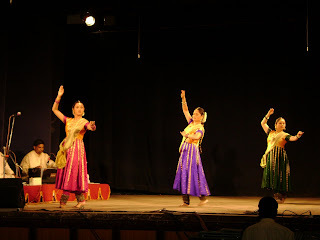 Cosmic Nad, a Kathak dance group was performing for a NGO - Prashanti Cancer Care Mission (PCCM).We were at the Jawahar Lal Nehru Memorial Hall, Camp just after 6 pm. It is an old hall and still standing. Not more than 50 people were there. We scramble through the darkness and take the fifth row seats in the middle. Then we got dazzled by the art. The pulsating feet of the kathak dancers, the vocals, the gently looping sound of the harmonium, the breathtaking tabla. It is a polished, delectable performance, emanating of youth, tradition, rhythm and tradition. An old world aura. The striking of one body against another with some sharpness; impact; blow. Thanks for your feedback, Deepanjali. It is good to know someone is reading the blog apart from myself.